This week Morning Feature looks at the growing fractures in our society and political system. Yesterday we considered whether our constitutional crisis will trigger a separation or, at least, a creeping balkanization. Today we explore whether we might move toward a parliamentary system. Tomorrow we’ll conclude by asking if we’re mistaking a transitory strain for a permanent condition. The current Congress is even more polarized, and Charlie Cooke listed only 25 U.S. House seats as competitive for 2016. Add the fact that studies show voters hold the president more accountable than Congress, and Republicans in Congress have almost no incentive to cooperate with a Democratic president. The same would be true for a Republican president, if Democrats held either the House or Senate. In a parliamentary system, deadlocks get resolved. A prime minister who lacks the backing of a parliamentary majority is replaced by a new one who has it. If no such majority can be found, a new election is held and the new parliament picks a leader. It can get a little messy for a period of weeks, but there’s simply no possibility of a years-long spell in which the legislative and executive branches glare at each other unproductively. Specifically, a parliamentary system is one where the executive branch is accountable to the legislature. In that system, voters elect local representatives to parliament and the parliament elects the head of government – e.g. : England’s Prime Minister or Germany’s Chancellor – who directs the executive branch. Some countries add proportional representation, where each party’s bloc in parliament reflects its percentage of the party preference vote. 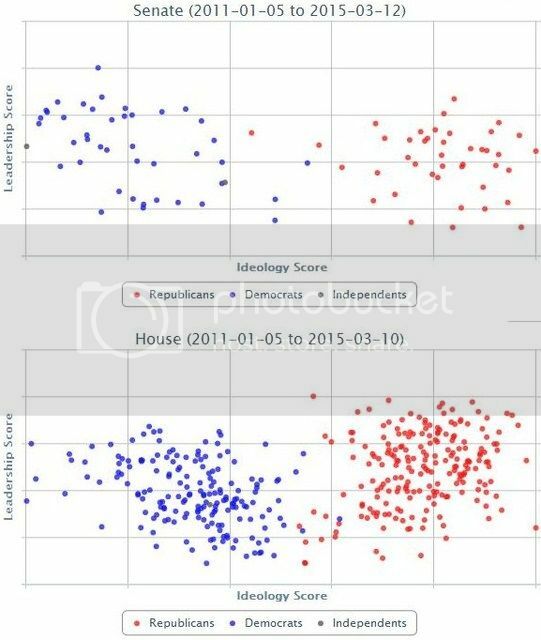 In a proportional parliamentary system, you might vote for Smith (a Democrat) as your local representative, and for the Democratic Party as your party preference. Or you may loathe your local Democratic candidate, vote for Jones (a Republican), yet still choose the Democratic Party as your party preference. The winner of each local race gets a seat, and ‘extra’ seats are assigned by the proportion of party preference voting – usually with a minimum threshold for representation – filled from party lists. To keep things simple, let’s use the outcome of the 2012 U.S. House elections. Republicans won 234 seats to Democrats’ 201, but 51% of the voters chose Democratic candidates. Let’s assume the party preference voting would have matched the candidate totals: 51% for Democrats and 49% for Republicans. (Note: I’ve disregarded the 3.6% of voters who chose other parties, as the threshold for representation is usually 5%.) Republicans would seat 234 members, those who won their districts. To make that equal their proportion of the party preference vote, the House would need 476 seats. So Democrats would get 242 seats, the 201 district winners plus 41 ‘extra’ seats filled from their national party list. In most parliamentary systems, the upper chamber (our Senate) has only a limited legislative role. So our House would choose our head of government, with 239 votes needed for a majority. Democrats would have more than enough votes in hand, and in practice the head of government is the leader of the majority party, or the leader of the largest party in a majority coalition. Thus, given the 2012 voting in a proportional parliamentary system, Prime Minister Nancy Pelosi would be our chief executive. With a solid Democratic majority behind her, she could pass bills. Depending on the constitutional system and the specifics of a bill, it might then go to the Senate for ratification. Or it might go directly to a largely ceremonial President, our head of state, who would sign it into law. Importantly, Prime Minister Pelosi would also choose her cabinet, who would lead the federal agencies that carry out the laws. A federal court might still overturn a law as unconstitutional, but other than that the majority party would pass and carry out laws. This would eliminate both gridlock and gerrymandering, as party preference voting and proportional representation make gerrymandering moot. If Prime Minister Pelosi pushed too far, some House member might file a motion of no confidence. Unless at least 239 members backed her, Prime Minister Pelosi would lose her post. In most parliamentary systems, the President would call for new House elections, and the newly-elected House would choose a new Prime Minister. The other downside is the near total exclusion of parties who aren’t part of the majority coalition. Yes, they could form a shadow cabinet whose members observe their respective federal agencies. In theory, this allows them to learn the agencies’ ins and outs, so they’re ready to go if and when their party wins the majority, and provide oversight by reporting on corruption or incompetence. But shadow cabinet members – and their parties – cannot block the agenda of the majority coalition. If voters choose an extremist party, they are likely see extreme policies become law. Finally a parliamentary system would not resolve gridlock between the federal and state governments (e.g. : Republicans’ refusal to create state exchanges or extend Medicaid under the ACA) or lessen the divergence between state governments. As a practical matter, it’s hard to imagine any path toward a parliamentary system that does not require a constitutional convention … and that’s why it’s unlikely to happen. Tomorrow we’ll see more plausible outcomes of our current gridlock. NextMidday Matinee – Friedai Critters fur March 13th! Wealthcare Act on Hold; Single-Payer Soon? The proposal appears to confuse “proportional representation, where each party’s bloc in parliament reflects its percentage of the party preference vote.” with the prime minister versus elected president question. If we had proportional representation based on the national vote, we would have extra democratic senators providing a majority vote for the president. [N]o state, without its consent, shall be deprived of its equal suffrage in the Senate. In other words, the least populous single state (currently Wyoming) could veto that amendment … and I think several of the smallest states would. Update: on further reflection, there might be a way. The amendment could provide that each state still seats 2 senators, elected statewide, with ‘extra’ seats assigned based on the national party preference vote, filled from national party lists, and representing no state. It’s interesting to consider the parliamentary form of government, but I fear the way this country is going now we’d probably see a situation more like Italy, where we’d be electing a new government every few months or so. The divisions among us are deep right now, and I don’t see a way to heal them.